Including a personalized video in an email can increase your open rate by about 50%! It stands to reason, but only if you do it right. While personalization can be a powerful strategy, it only works when it is done correctly and when it is in your company’s best interest to do so. Here are the most important ideas to consider when choosing whether or not to personalize your marketing and video campaign. Do you have valuable personal data? Tailoring a video’s content to audience demographics, buying patterns and feedback is what will make the difference. That is how you create a meaningful conversation, which is the most important thing to do in today’s digital age. 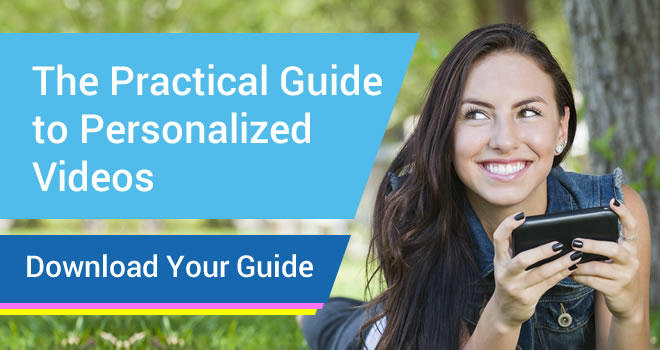 If you don’t have personalized data for your recipients, do not try to personalize your video. One thing that limits marketers is thinking of the potential data as only what you collect on a web form. Utilizing insights such as web activity, purchase history and account information can make your video messages much more tailored to each specific viewer. Evaluate your current data practices to determine if you have enough data for a truly personalized video campaign. If not, work on building up the processes in place for collecting customer information and analytics. Will this actually impact your business or does it just seem like a cool thing to do? If you’re only marketing to tiny niche segments of your audience, you probably won’t need to further personalize your video messages. In fact, if you’re only marketing to tiny niche segments of your audience, personalization often winds up costing you more than you’ll get in return for your efforts. For example, PPL – an energy provider in Pennsylvania–knew that the vast majority of its customers were likely trying to find ways to reduce their bills. By personalizing video to meet this need, they increased their success rate by 335% compared to other industry benchmarks. Is your video going to be received at the right time in the customer lifecycle? It is important to get your customer’s attention at just the right moment so that they are open to your message. New customers, for example, are more receptive to marketing and other messaging. Adding a video as part of your onboarding process can make a large impact. Adding a video to a customer’s monthly billing statement would be such an insignificant message it wouldn’t give you the kind of return a personalized video campaign should. However, adding a video when the customer’s bill has changed could help clarify this change and become more impactful. Recurring communication will definitely offer more benefits than a one-off campaign. Still, you don’t want to send these messages too often or you’ll alienate your audience. Once per quarter is usually sufficient. Using our previous PPL example, knowing when their customer’s bills are likely higher than usual and sharing ways to save money was a brilliant move. Incorporating this method increased their view rate by 34.7% and increased clicks on their call to action by 13%. Try to incorporate that logic for your own audience. When do they most need help? What issue is most likely affecting them during that quarter? Go to them; don’t assume they’ll come to you. In order for personalized marketing to truly be a worthy investment you need to identify the cases when business impact is going to be big. You need to gravitate toward cases or issues that are highly visible and, of course, you need to have an effective method for distribution. If you’re only sending these messages via email, make sure you have enough emails to warrant the blast!